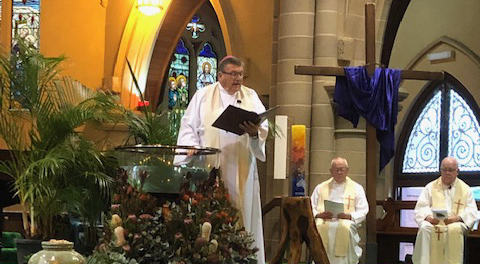 The Rockhampton Diocesan Assembly 2019 was convened at St Joseph’s Cathedral last week, following a Chrism Mass attended by priests, parishioners, assembly delegates and students. The opening liturgy was attended by 170 delegates from across the diocese, representative of those who had attended the regional “listening gatherings” held in 2017 and 2018. “This is a diocese of many challenges – those of distance, isolation, poverty, impacts of economic downturn, impacts of fly-in/fly-out mining workers on towns in the region. There are many challenges to family life,” Bishop Michael McCarthy said. Rockhampton Diocese covers 415,000 square kilometres of Central Queensland from Mackay to Bundaberg along the coast and west to the border with the Northern Territory. “There are some places where Mass may only be celebrated on rare occasions, such as Bedourie in the far west,” Bishop McCarthy said. Last year, Bishop McCarthy travelled to Bedourie – a journey of 16 hours from Rockhampton – to visit and celebrate Mass. The theme of the diocesan assembly was “Into the Deep”, with the symbol of water – an element so crucial in the diocese with many communities suffering from years of drought. The story of Jesus walking on water, inviting Peter to step out into the deep, was a central motif. “The assembly was marked by excellent discussions, deep reflection and some beautiful liturgy and moments of prayer. There was such a richness of stories,” Bishop McCarthy said. In his final address to the assembly, Bishop McCarthy said: “The spirit of the Lord has been here with us this weekend. Our assembly is about our diocese. We need to nurture the strength we have seen here this weekend. This is the Church that we are working together in as the people of God. Prior to this year’s assembly, “listening gatherings” were held in each region of the diocese, facilitated by local people to raise their pastoral needs and suggest solutions. At each of the gatherings, Bishop McCarthy listened to his people and asked them to continue to consider local, regional and diocesan needs, and to come together in Rockhampton to discuss those needs with a view to drafting a 10-year pastoral plan. The Rockhampton assembly process was developed by diocesan pastoral coordinator Joy Philippi and Shane Dwyer from the National Centre for Evangelisation. • Priorities of evangelisation – how to minister to those in the region who are disadvantaged and marginalised, to the youth and young families, and the elderly. Delegates gathered in groups to develop propositions for the future and their propositions will be collated, refined and discussed further with the eventual result being a map to guide the next 10 years. Bishop McCarthy said his diocese is looking forward to the Plenary Council 2020 and engaging with the wider Church in Australia. During the assembly, Plenary Council facilitator Lana Turvey-Collins led a session on the Council. Ms Turvey-Collins said attending the Rockhampton assembly was an experience of a truly synodal Church: “the people of God gathered together, speaking truth, listening deeply to one another and to the Holy Spirit and making decisions together”.